Big Walnut’s Carson Becker, left, drives toward the hoop as Buckeye Valley’s Austin Richard defends during the first half of Friday’s non-league showdown in Sunbury. 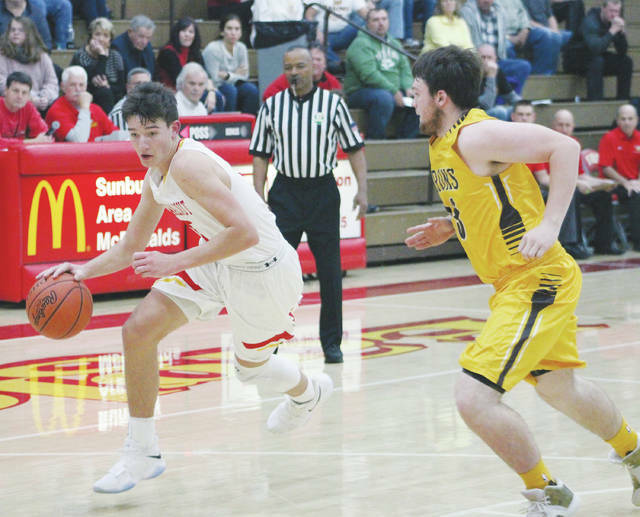 Resolve, reliance and response were the three things Big Walnut boys basketball coach Brett Bartlett saw out of his squad in a 55-52 win over Buckeye Valley Friday night in Sunbury. Sophomore Kegan Hienton scored a game-high 17 points to lead the Golden Eagles’ comeback effort after a loss to Watkins Memorial Thursday night to open the season. Bartlett and Hienton each talked about the team’s effort in the win after a sluggish performance the previous night. Junior Nathan Montgomery turned the ball over on what appeared to be BW’s last possession of the third quarter. But, Montgomery gave the perfect example of the resolve, reliance and response on the next play. With just over 3 seconds left in the third quarter, he denied the inbound pass for a steal, pump-faked, then buried a three-pointer from the left wing at the buzzer to give the Eagles a 44-40 lead through three – part of a 10-1 run that pushed the lead as high as 8 early in the fourth. Montgomery scored 13 points and Carson Becker and Jordan Koebel finished with 12 points apiece for the Eagles. Part of that resiliency was holding off the short-handed Barons, who got three-pointers Dylan Herbert, Clark Newland and Luke Lucas in the fourth quarter to keep it within striking distance in the final minute. With only eight players on the roster to begin with, the Barons lost last year’s leading scorer Ethan Crawford at the 2:29 mark of the first quarter with an apparent separated shoulder. Crawford appeared to know what had happened as he walked off the floor holding his arm. Gast said Crawford suffered the injury in football earlier in the fall. Still, Gast loved his team’s effort. Herbert led the Barons (0-1) with 15 points, Max Stokey finished with 11 and Lucas added nine. BV is right back at it tonight when it hosts Olentangy Orange in non-league action at 4:30 p.m.
BW is off until Friday when it opens OCC-Capital play at Canal Winchester at 7:30 p.m.
https://www.delgazette.com/wp-content/uploads/sites/40/2017/12/web1_bvbw-1.jpgBig Walnut’s Carson Becker, left, drives toward the hoop as Buckeye Valley’s Austin Richard defends during the first half of Friday’s non-league showdown in Sunbury.